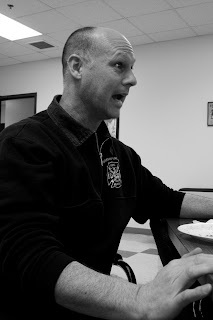 Pictured about is MPFD Firefighter Randy Keeler. Copy block to follow. 2 year old Elijah Raymond is always on the run. His grandpa seems to be the only person or thing that can slow him down. Duane McMichael got to choose when he was ready for fatherhood. Becoming a grandfather was sprung upon him abruptly. McMichael, 52, wasn’t ready for the news that his oldest daughter was pregnant. Being the average two year old, Elijah has the stamina of a track star. He can’t seem to share but loves running back and forth between his two play rooms. It’s not uncommon for families in this day and age to not be “normal.” By normal standards a family consists of a mom, dad, children and maybe siblings. The McMichael clan fit into the norm only so much. McMichael lives with his wife and youngest daughter. Elijah His daughter and grandson, Nicole and Elijah, live close by. McMichael is the only father figure in his life.